Launching a product is starting to become almost Applesque with ALO Audio these days. Gone are the nerdy amp numbered branding of yesteryear and in comes iconic images of American history combined with a smooth West Coast nostalgic feel that just gives a sense of actually buying into an experience rather than a product that makes your music sound better. I am getting a heightened sense of expectation these days and it is pretty enjoyable ride for sure. The Pan Am was a surprise, the lead up advertising was rich and promising and the curiosity was, well, very high indeed. Now I have to admit the new Pan Am is a bit of a departure for ALO in regards to their legacy of portable amps. Sure the Pan Am is portable (just!) but the Pan Am in every sense of the word is a radical departure from the National, the RX MK3 etc but in some ways is a natural extension of their sound and more than a nod towards the potential of the Continental and what can happen when you take tubes beyond the desktop. The whole package is so well thought out you had to wonder if this is going to be the final developed system and true enough the guys at ALO confirmed that what we have right now with the Gateway, the Passport and the Pan AM itself may not be the final evolution of the system with a road-map some way down the line that might make the initial investment seem like a very shrewd investment indeed. I won’t say what they have in mind but when they mentioned it I thought yup that makes total sense. Anyway lets put the future out of our mind right now and focus on the now and what I have in front of me. Ok so first up I mentioned modular and true enough the Pan Am is more than just a single amp, but also includes the optional PSU Gateway and the very handy Passport battery stackable modules. Together this holy trinity of circuitry combined with some legendary boutique cans has allowed ALO Audio to simply hit one out of the park with seemingly minimal effort and a lot of grace. This three tier stack looks fabulous and much smaller than I thought likely before opening up the little retro black boxes they came packaged in. The units come in silver and black, take your pick, either looks good to me though I ended up with the silver variant due to my pet peeve of seeing dust now on my black plated amps at a 100 yards. So how does the triple stack Pan Am combo work? 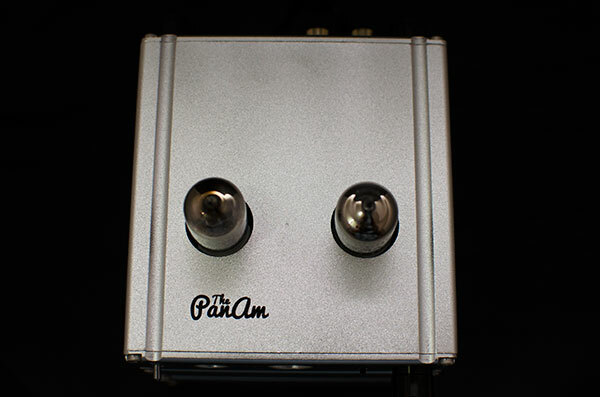 The Pan Am itself is both a tube amp and DAC that sits on top of the stack (if buying all modules) and is armed with multiple inputs and outputs including USB Input, line in and analog RCA inputs with a selector dial for controlling which input your using. On the front you have the power switch, a 3.5mm and quarter jack input, gain selector (high and low) and the volume pot. The tubes for the Pan Am are 6J1, 6AK5, 6BC5, EF40, 5654, EF95 and WE403 compatible and as standard you get a Chinese 6J1 tube which is ALO describe as a bit of a work horse of a tube with decent mids and lows and should serve most well. 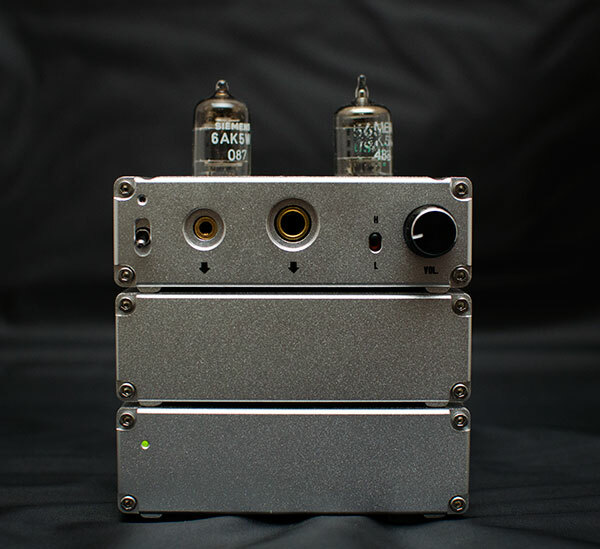 There are no other outputs so consider this an enclosed pure headphone amp much like say the Burson HA-160DS but of course on a much smaller scale. And small it most definitely is being not much bigger than the Triad Audio Lisa L3 amp which is classed as a portable headphone solid state amp. It is certainly not as long as the L3 with only the tubes themselves adding any significant height over the L3. The DAC itself is a Wolfson chip capable of 24/96 out of the USB though ALO has not revealed exactly what Wolfson chip they are using. I have always preferred the Wolfson chips range for their added musicality over some of the more digital sounding DAC chips in the market today and this one is no exception. The amp itself comes with two metal covers for the tubes which are primarily for cosmetic and protection reasons and given the dusty conditions in my country I have to say this was most welcome. Otherwise known as the Passport this is simple add on with a similar form factor for stacking underneath the Pan Am. 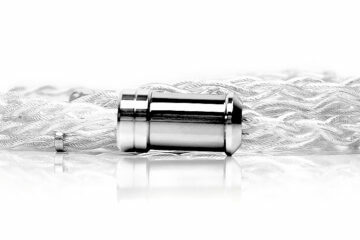 ALO Audio have very nicely supplied matching length power cabling connectors to minimize wire tangle and keep everything very discreet at the back. Battery life is rated at 10 hours officially but your mileage may vary depending on usage. With the Passport the Pan Am twin stack becomes essentially a transportable device and a must for our local forum meets given its size. Those wondering what to get in the modular system after buying the Pan Am should opt for the Passport first. It comes standard with a charger and the performance is excellent for the battery time you get which is sadly a tad short but very much worth it. The passport is perfect for those afternoon sessions and meets where a wall socket is not available. It turns the Pan Am into a much more flexible beast and is a real head turner. 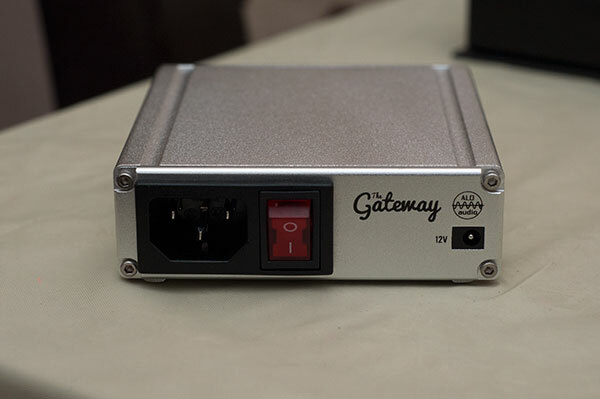 The Gateway is the matching PSU conditioner (read upgrade to wall warts) and the final component in the three tier stack and as such takes on the same form factor to fit neatly under the Gateway and Pan Am itself. You can run this or the Gateway into the Pan Am or run the Gateway into the Passport for charging purposes. 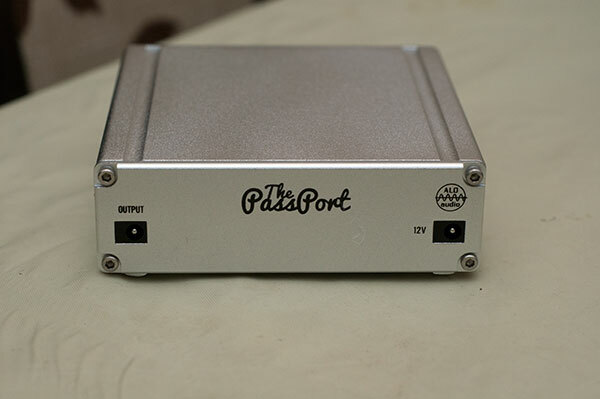 There are some sonic differences in using the Passport over the Gateway as the power unit but at $149 is a nice but not necessary add on if your on a strict budget. Those with dirty power sources though might see this as necessary and those who are used to very long listening periods may wish to use the Gateway into the Passport to save on charging down time. It will run 110-240v also so no need to worry about regional power variations if your thinking of getting one. Once you get to a triple stack I did find the small form factor to work slightly against the Pan Am in terms of stability when taking in and out headphone jacks. The finish of all three components are much like the National and Continental portable amps and whilst extremely attractive and professionally finished the units themselves where prone to sliding back a little too easily on their rail guides when pressure to the front was applied. They are indeed very light components but the higher the stack the more it made me feel a bit more friction resistance in the rail guides on each component or a stopper at the back would be very useful to keep everything steadier. Of course if new modules come out with a 4 or 5 tier structure this baby is going to get higher and higher so I do hope new modules have some more friction resistance to ensure the whole thing doesn’t become like a deck of cards. If your in possession of the Continental and the National you might consider the Pan Am to sit somewhere in between the two tonality wise. The detail retrieval is certainly a notch or two higher than both and its primarily aimed at higher end headphones to maximize on the potential of the DAC. 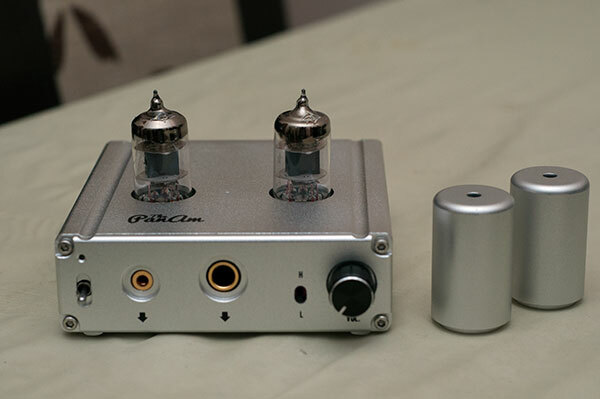 Despite it diminutive size the Pan Am packs plenty of power also so those with planers, particularly the LCD-2 will certainly want to take a look at this. The Pan Am still retains that lush tube sound of the Continental but adds a bit more weight and texture at the lower end and smoothed out the highs giving a slightly darker tonality without loosing one iota of clarity. Some have mentioned before that the Pan Am sounds more like National with a more pronounced mid-range and I have to concur with that sentiment. The Pan Am is one of the smoothest and most pleasing tonal reproductions I have heard to date at this range to be honest. The tweaking from the previous two portable incarnations has got the sound just right for me. Nothing overly pronounced or dark, spikey or too hot and fatiguing. This is listening for pleasure and for long periods also I may add. The wonderful musicality of the Pan Am is very addicting indeed. Much of this enjoyable tonality has to come down to the smart tube selection by ALO Audio. The stock Chinese 6J1 is pretty darn good if that is your lot when buying the Pan Am. Nothing to complain about, decent mids and good lows but put in context of the NOS 6AK5W Siemens tube that ALO Audio threw in there is really no contest. For $30 these are cracking little tubes. The guys at ALO did mention to give some burn in time for them to shine and yes they do sound a bit bright out of the box but after a few days solid playing they really opened up on the mid-range giving the LCD-2’s the perfect match. The final batch of tubes I received were some NOS 6J1-P EV Russian Military tubes which yield a stronger bass impact than the Siemens or the stock tube, a bigger stage than the stock but not quite as developed in the mids and highs as the Siemens. Overall I preferred the Siemens due to the greater balance across the range and the very lush mids than the stock and Russian tubes but bassheads may prefer the Russian tubes. Matching the Pan Am to the right headphone of course is down to individual listening preferences but those who have read some reviews before will note that most have waxed lyrical about the Audeze LCD-2 and Pan Am match to be one of the best there is and I cannot deny that. I have been a long time user of the Hifiman HE6 and whilst volume wise it can manage it, the Pan Am just does not do it justice but with the LCD-2 rev 2 the match is nigh on perfect at this price point. Everything just felt beautifully coherent clear and wonderfully musical. This really shouldn’t be from such a small form factor right? I mean before I had pretty much assumed bigger was better but not in the case of the Pan Am. 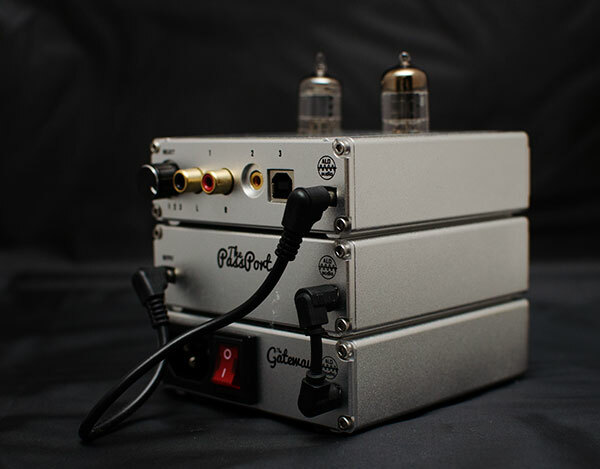 Tube amps traditionally have not performed as strongly as solid state for me with the LCD-2. Side by side my Woo WA6 gets far less favor than my Burson HA-160 for the LCD-2 but the Pan Am matches and in some cases beats the Burson Audio for musicality, sound stage and clarity. That is some feat to be honest. Power wise the dial sits somewhere around 10-11am on the LCD-2 V2 so there is plenty of juice on tap and I didn’t detect any clipping or distortion either. I wasn’t so lucky on the HE6 which went to about 12-1pm on the dial but a little distortion started creeping in beyond that and the sound was a bit too thin for my taste. Using a Beyer T1 stock the volume demands stayed much the same at the LCD-2 Rev 2. The Siemens tubes I found to be an excellent match for the T1 also bringing out a pretty full mid-range and a pleasant top end and coherent bass though not as impactful as the LCD-2 out of the Pan Am. Other headphones had varying results with my HD800 lacking a little in the big sound stage I am used to but the AKG K550 having improved bass details and a slightly warmer fuller mid range. Well the list goes on but the LCD-2 is the winner right now in terms of matching. Mind you out and about with a twin stack tube amp and the LCD-2 is not the most portable of setups I have come across but I know a few hardy souls who will not mind that. Switching to IEM’s and the 3.5mm output produced some varying results for me personally. Using my Um Merlin’s I found at very low volume levels a little crackle and feedback. I noticed this also at zero volume with the pot in general with some RF interference so perhaps the solder at the spot might need reinforcing or cleaning. Anyway back to the Merlins and using Beats Audio silver sonic which is Silver coated copper the Pan Am had maybe a bit too much oomph even at low gain to really accurately control the Merlins which topped out at about 8-9 on the pot. Nevertheless the sound was very smooth indeed but perhaps a tad too warm for the already very dark and bassy Merlins. I am constantly striving to get a slightly brighter tonality to the Merlins without any loss of the deep bass and massive sound stage – almost like trying to move it to a LCD-2 rev 2 like tonality and I am not sure the Pan Am is the best match on that basis. Using my Sony MDR EX1000’s I still had the same concern with the sensitivity issues even on low gain with some noticeable background noise at low levels and inability to move beyond 9am on the pot. Tonality wise I enjoyed the thicker more expensive mids but it didn’t necessarily tame the sparky highs of the EX1000. Overall I am not sure the Pan Am is for IEM lovers given the sensitivity settings of the two I tried though tonality wise its down to a case of the right match and if you don’t mind the low volume control levels. The Pan Am reminds me of the T.A.R.D.I.S. from Doctor Who to be frank -small on the outside and huge on the inside. The fact it can push the LCD-2 this well is something to behold given the competition is about 3-4 times the size. The modular potential is fantastic and the transportable potential is very useful indeed. It is not the final word in DAC prowess and as yet there is no pre-amp and spdif outputs so beware if new modules come out as your total investment in the system will get very high indeed. In some ways this reminds me of a luxury tube version of the FiiO E09k and E17 such is the compact neatness of the Pan Am system and how everything fits neatly right beside your laptop. The added bonus of cheap tube rolling given the three samples included top out at $30 a pair should bring added incentive to those with large collections to give it a try. Yes it is a bit of a departure for ALO Audio in terms of form and function being the past masters of pure portability but the sound is very much all ALO and those with previous National and Continental releases will really enjoy the Pan Am. Dangit, I wish I had spent more time listening to this at CanJam 2012. 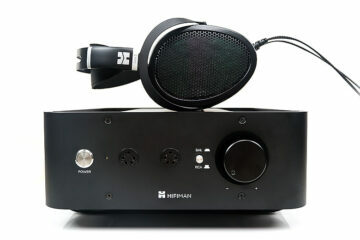 I gave up after trying it with HD800, but would love an extra amp for LCD-2 that is small and transportable. 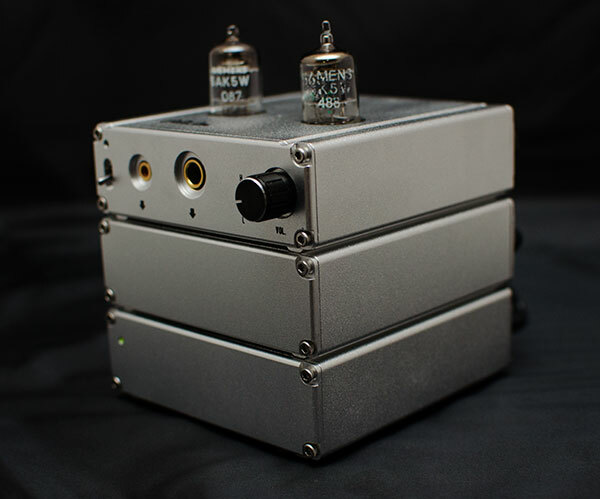 If I didn’t have an SR-71b to drive LCD-2 in balanced mode I’d buy this just to try out. I agree Larry, the Pan Am is ok with the HD800 but not truly spectacular and is more in tune with the LCD-2. The small form factor means though it is sadly missing some sort of balanced mode though I would love to see that addressed through some sort of module balanced module or an SPDIF input. I am looking forward to trying it with the SOLO -dB shortly also.